These are Carlo clubs from the very early 1970s. Carlo (Charles Lewis) was the author of the very popular book The Juggling Book, in which he described how to make the clubs pictured here. 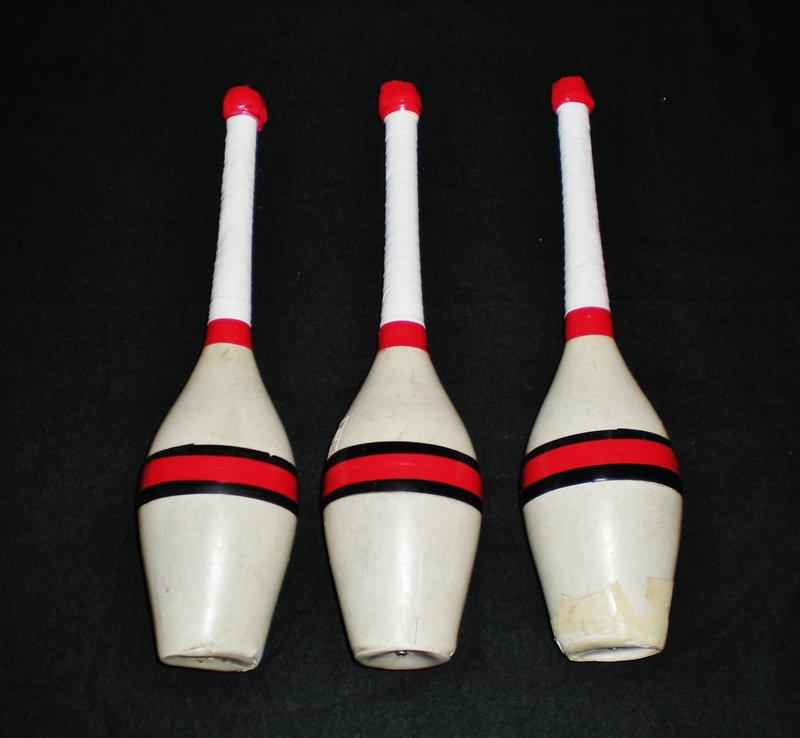 These examples are very well made using lathed-turned dowels with tapered handles and knobs that fit perfectly into the plastic toy bowling pin bodies. The handles and knobs were then wrapped in colored tape. They were discovered in a suitcase in a vintage thrift store in New Jersey. This is a giant Ken Benge model Stu Raynolds club. It is actually the prototype / sample club for this model and is made of fiberglass. This was the biggest juggling club produced since Harry Lind and Edward Van Wyck’s giant basket clubs. Donated by Cindy Marvell. This is a very small child-sized David Moreira model Stu Raynolds club. It is actually the prototype / sample club for this model and is made of fiberglass. This was originally made for David Moreira (David Lee / David Lucas) when he was a young child. Donated by Cindy Marvell. This is a Stu Raynolds fiberlgass European club. Donated by Kit Summers. This is the only existing example of a Larry Merlo club. Larry made these clubs in 1972. The handle was lathe turned out of pine and the knob is a hardwood furniture knob attached to the handle with a dowel. There is a 3/4″ dowel that runs from the handle to the tip which is made from marine plywood and topped with a polyethylene disk. The handle is wrapped with bicycle tape. 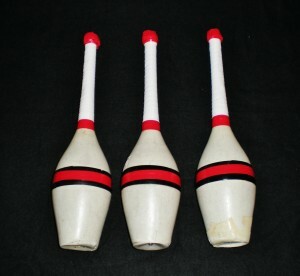 The plastic bowling pins used for the body were bought from the Worcester Toy Company. This is a Jay Green European club from 1974. It was the first plastic, soft handled European club. Jay Green started making clubs in the early 1960′s in New York City, NY (USA). Donated by Arthur Lewbel. These are very rare Claude Crumley European clubs from around 1976. They were made by Claude using wooden dowels, plastic disks, a fiberglass shell, and cork ends. Claude Crumley was based out of Chicago, IL (USA) and was best known for his fiberglass rolling globes. Purchased from Randy Schukar. This is very early Dube multi-piece European club from 1976. 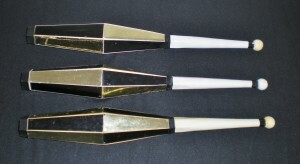 It was the first multi-piece club with a custom made mold for the body. Donated by Tim Schooley. This is an early Dube American one piece club, first introduced in 1976. It was the first one piece American style plastic club ever produced. Donated by Reid Belstock. 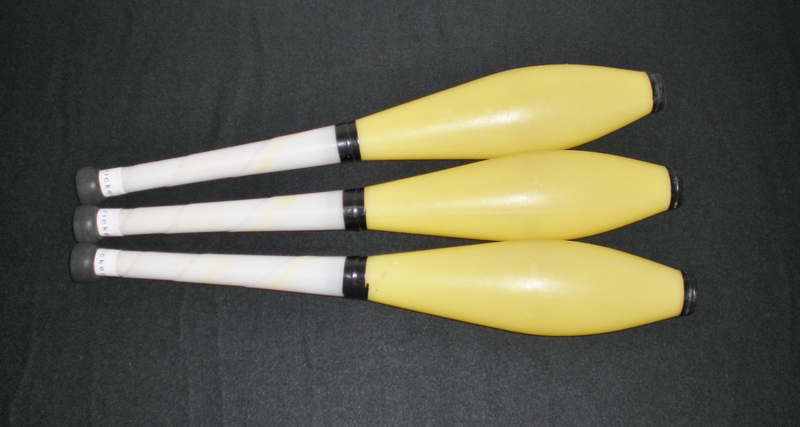 These are Gemini clubs made in 1977 by Rob Leith of Gemini Juggling of Roseland, New Jersey, (USA). 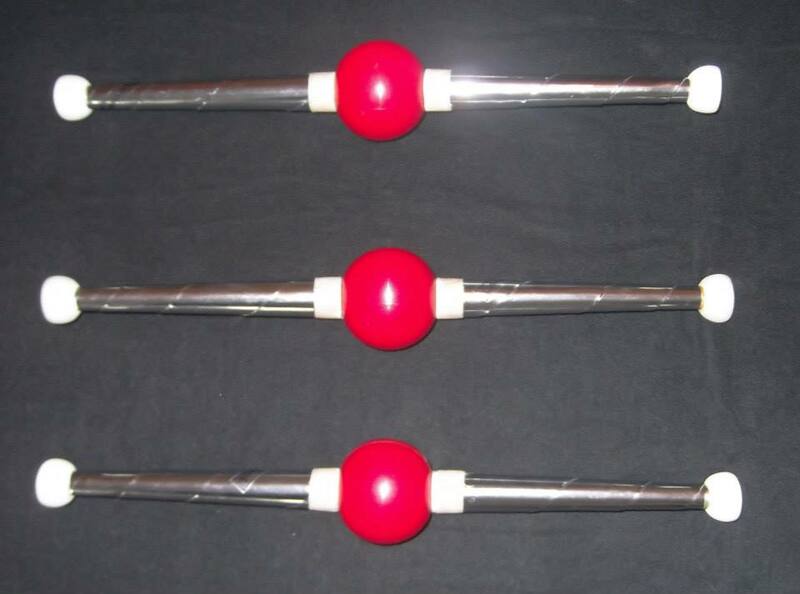 These are the first one piece plastic clubs made using a rotational molding process. Donated by Jek Kelly. 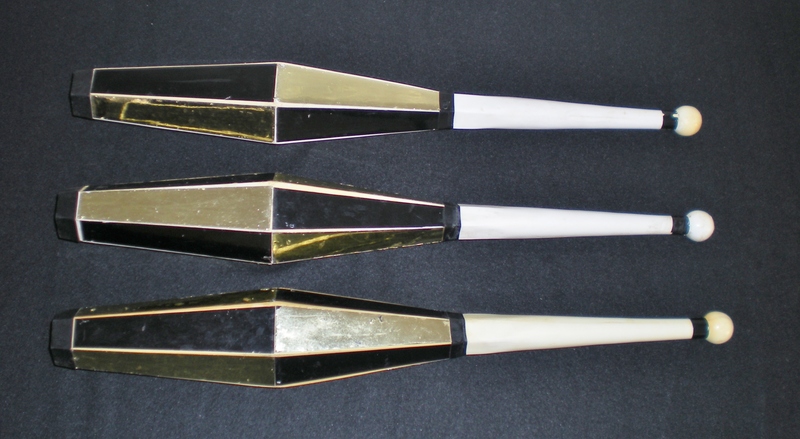 These are Gemini octagon clubs made in 1978 by Rob Leith of Gemini Juggling of Roseland, New Jersery (USA). 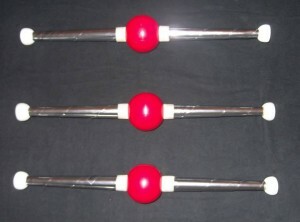 They are one piece plastic clubs and were made using a rotational molding process. Donated by Jek Kelly. This is an original Jugglebug club from 1977. 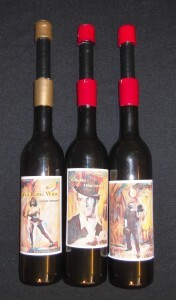 It was the first juggling club produced for the mass market. The body and handle are one piece of plastic with a wood dowel and screw on knob. Donated by Dave Finnigan. This is a very rare Lee Letchworth club from 1978. Lee made his clubs using urethane expanding foam around a wooden dowel. A knob, end cap, and tape decorations were then added. Lee made his clubs from 1975 to 1981. Donated by Lee Letchworth. These are Jugglebug Hexagonal clubs from the early 1980s. They were injection molded out of ABS plastic. While they look great, they are not easy to juggle with! Only 600 were ever made. Purchased by David Cain. This is a Vegas Club from the TAL Corporation, otherwise known as Thomas, Albert, and Larry Sikorsky. It has a six sided body covered in silver lame material and is constructed with a wooden dowel, struts, internal disc, and end cap in the traditional “skeleton club” design.. Donated by Dave Finnigan. This is a Jugglebug Glow In The Dark club from the early 1980s. This was the first retail glow in the dark club. Donated by Dave Finnigan. This is a Ricker club made by Rick Bright from the late 1980′s. 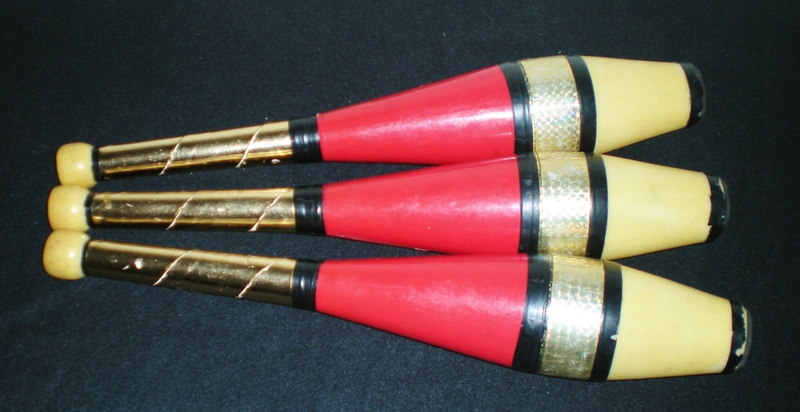 Rick made these larger, more visual multi-piece clubs with their distinct ascot decorations in California, USA. The body was rotationally molded one at a time within an aluminum mold. Donated by Rick Bright. These are Ricker numbers clubs, which were first made in 1986 in Southern California by Rick Bright. Donated by Rick Bright. This is a rattan club with a hardwood dowel. It was used by the Philippine Pride jugglers in the late 1980′s. Wicker type clubs like this date back to at least the early 1900′s, when John Breen became the first person to juggle 7 clubs using such clubs. Donated by Dave Finnigan. 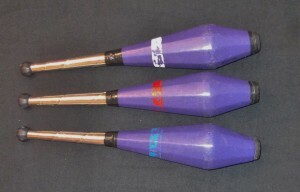 In 1985, Renegade Juggling developed the Numbers Club (shown above), now known as the 75mm club, at the request of Nick Gatto for Anthony Gatto to use. This club was lighter and thinner than standard European composite clubs. Anthony was able to flash 8 clubs using these and also used them in his initial training with 6 and 7 clubs. They were made available to the public shortly afterward and have been for sale ever since. Donated by Lee and Joy Jackson. This is a SoftClub made by the Reflection Company of Blacksburg, Virginia (USA) starting in 1991. It is composed of a soft foam body around a wooden dowel. This club became popular among players of Combat / Galdiators. Donated by Jack Kalvan. These are ten sided Nikita clubs made by More Balls Than Most (UK). The knobs and end caps are also ten sided. 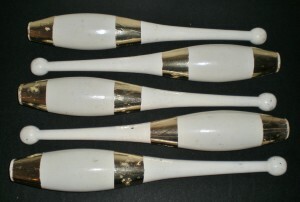 Donated by the Tunbridge Wells Juggling Club. 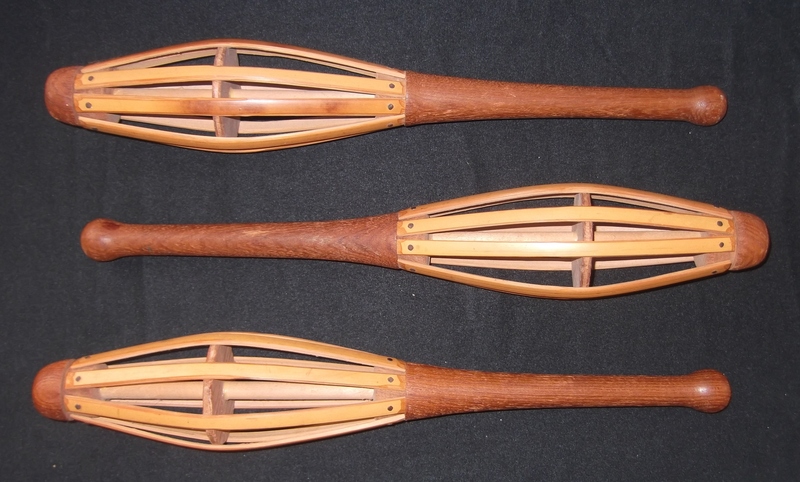 There are cherry and bamboo skeleton clubs made by David Booth of Eugene, Oregon. They were sold at juggling conventions in the mid 1970s. Obtained in a trade from Lee Letchworth. This is a wicker “ecological club” Made by Joglaries of Spain. Donated by Andreas Anders-Wilkens. This is a bamboo skeleton club of unknown manufacture. Donated by Andreas Anders-Wilkens. This is a Russian style wooden-handled club used by Oleg Tchapen. Donated by Andreas Anders-Wilkens. This is a Radical Fish club made by Beard Juggling of the UK. They were first introduced in 1992 and are unique in their shape. This is a Freaks Unlimited Acrobat club from the UK. It was the first multi-piece club with a plastic dowel instead of a wooden one. It was introduced in 1993. Donated by Freaks Unlimited. This is a prototype rainbow foam club with a hollow, plastic dowel from the late 1990′s. It is one of only four ever made by Dave Finnigan. The other three were juggled in the 1999 Macy’s Thanksgiving Day Parade by Ronald McDonald. Donated by Dave Finnigan. This is a wicker club made and donated by Andy Clay. This is a Renegade cuphead club. Donated by Erik Aberg. This is the prototype Jay Green Transformer club, which becomes a torch when the top is unscrewed. Created and donated by Jay Green. 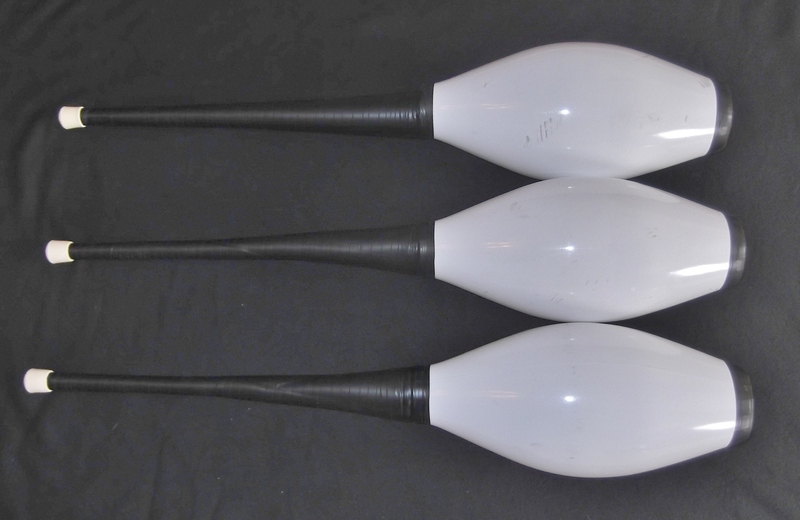 These are Goliath clubs, the largest usable juggling clubs ever made. They are 34 inches long and 7 inches in diameter. Created by David Cain. This is a porcelain juggling club created by artist Jo Kamm. It’s a full-sized club and can be juggled. It will, however, break upon being dropped. These clubs were made as part of the art project Dangerous Games. Click here to see Jo’s porcelain props being juggled. Donated by Jo Kamm. This is a crocheted club made by Erica Kelch-Slesnick in 2014. It has a wooden dowel and is stuffed with plastic bags. Donated by Erica Kelch-Slesnick. 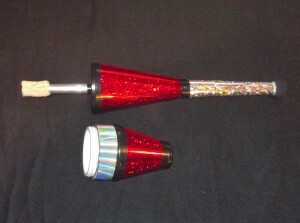 One of a kind bounce club made by combining a silicone ball with a Freaks Unlimited Kestrel Club. Made by David Cain. British bulb club from an unknown maker. Donated by The Void. 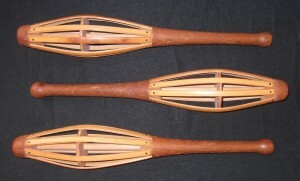 These are three double handled clubs made by Cabeza de Martillo of Chile. Donated by Charlie Holland. This is a modern skeleton club designed to be used in a Renaissance fair setting. Donated by Niels Duinker. This is a very early JuggleBug American club, circa 1976. Purchased by David Cain. This is a Super Juggler prototype club made by Scott Sorensen. It has an aircraft aluminum dowel and a foam body. Donated by Scott Sorensen. This is a Super Juggler prototype club made by Scott Sorensen. It has an aircraft aluminum dowel and a foam body and handle. Donated by Scott Sorensen. This is a laser cut skeleton club designed and made by juggler and artist Jo Kamm. Purchased by David Cain. 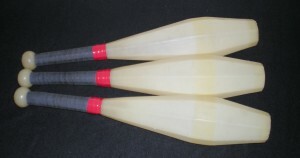 This is a plastic toy bowling pin club made and used by Dan Sadoff. Donated by Dan Sadoff. It is from the 1970s. 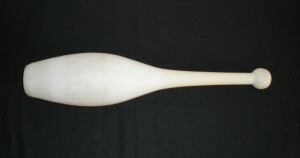 This is a Stu Raynolds fiberglass European club from the 1970s. Donated by Erik Aberg. This is a Lee Letchworth European club from the 1980s. Donated by Jerry Martin. This is a Jugglebug mini basic club with a one piece handle cushion. Donated by Dave Finnigan. This is a Jugglebug European club from the early 1980s. Donated by Dave Finnigan. This is a Mr. Babache Flash club. Donated by Erik Aberg. This is a basic Jugglebug club. Donated by Dave Finnigan. This is a hollow wooden club made by Phillip Gross. Acquired as part of the Paul Bachman club. This is a hollow wooden club of unknown manufacture. Acquired as part of the Paul Bachman club. This is a Johan Juslin Russian style club. Acquired as part of the Paul Bachman club. This is a foam Ikea club donated by Scott Cain. This is a foam Jugglebug club. Donated by Dave Finnigan. This is a rattan club with a hardwood dowel. Donated by Dave Finnigan. This is a fiberglass club made by Claude Crumley. Acquired as part of the Paul Bachman club. This is a fiberglass club made by Stu Raynolds. Acquired as part of the Paul Bachman club. 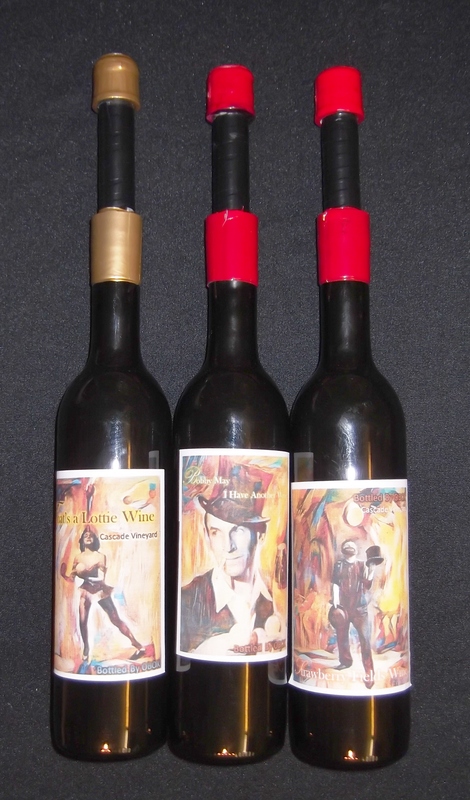 These are bottle clubs made by Obediah Thomas. Donated by Obediah Thomas. This is a foam club from the UK. Date unknown. Purchased by David Cain.